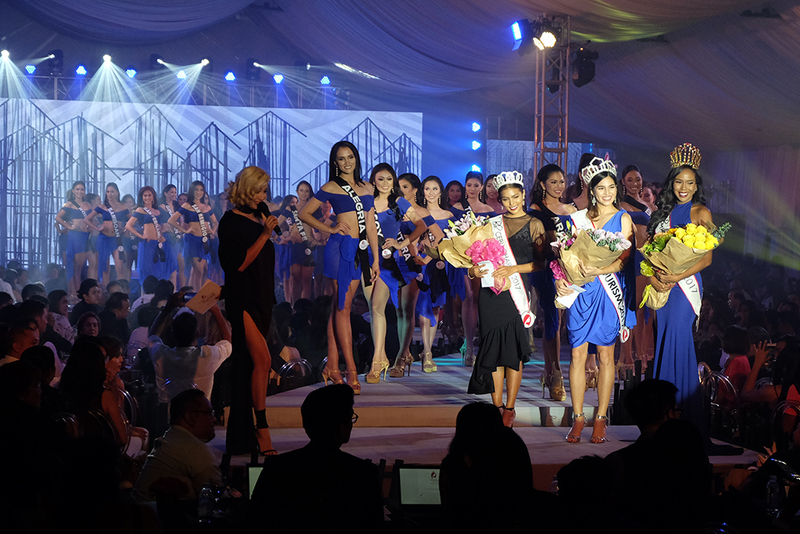 For the 54 candidates, it was a night of great importance as Binibining Cebu held its Long Gown and Swimwear competition last Wednesday, September 26, at The Tent in Mandani Bay. An integral part of the road to the five crowns, the candidates performance during the pre-pageant night would make up 60% of their scores that would determine their fate at the first cut during the announcement of the Top 20 at the Coronation Night on October 19. “How do you fit in 54 candidates on one stage?”, you might ask. But the stage had enough space for the candidates to perform a little dance number. This year’s long gown competition featured creations by eighteen Cebuano designers from the Fashion Association of Cebu’s Elite Talents (FACET). They are are Hannah Noel, Jan Tiong, John Arellano, Clieza Mayol, Lian Laoandalo, Jeph Polancos, Stef Tirado, Roxanna Baroquillo, Shayne Remoreras, Matthia Tangoan, Diane Ty, Nino Benito, Eyla Orais, Celine Borromeo, JP Cabigon, Pearl Arandia, Paco Serafica, and Carol Escasinas. After the candidates walked the runway in their elegant gowns, the top three designers were announced. They are Diane Ty, Celine Borromeo, and JP Cabigon. Check out their creations and the candidates who wore them below. It was so hot, the ladies just made it rain! For the much-awaited swimsuit competition, the candidates wore creations by Kymberly Maitland-Smith, owner of SOLTI Activewear. Blue is the color of choice for this year’s swimwear. Mark your calendars for the following pre-pageant activities that will drum up the excitement towards the grand Coronation Night! Binibining Cebu is presented by the Binibining Sugbu Charity Foundation, Inc. in cooperation with the Sacred Heart School for Boys Batch 1985 Foundation, Inc., Yahoo! Philippines, Xionwei Techology, Emperor Watch and Jewellery, Mandani Bay, and San Miguel Corporation. Which candidate do you think will bring home the Binibining Cebu 2018 crown? Let us know in the comments section.